Mefloquine may cause mental/mood or nervous system problems. Tell your doctor right away if you have any of these serious side effects, including: mental/mood changes (such as anxiety, depression, restlessness, confusion, hallucinations, suicidal thoughts/attempts), ringing in the ears, dizziness, lightheadedness, loss of balance, or trouble sleeping. These side effects may continue to occur even after stopping mefloquine and certain side effects (such as dizziness, ringing in the ears, loss of balance) may become permanent. This medication should not be used to prevent malaria in people who have mental/mood disorders (such as depression, schizophrenia). Who should not take Mefloquine HCL? What conditions does Mefloquine HCL treat? Tell your doctor right away if you have any serious side effects, including: loss of coordination, numbness/tingling/pain of hands or feet, vision changes, unusual tiredness, persistent nausea/vomiting, dark urine, yellowing skin/eyes. List Mefloquine HCL side effects by likelihood and severity. What should I know regarding pregnancy, nursing and administering Mefloquine HCL to children or the elderly? Other medications can affect the removal of mefloquine from your body, which may affect how mefloquine works. Examples include rifamycins (such as rifabutin), azole antifungals (such as itraconazole), among others. Does Mefloquine HCL interact with other medications? It is important to wear protective clothing, insect repellent, and use bednets when trying to prevent malaria. If you are taking this medication for a long time, laboratory and/or medical tests (such as eye exams, liver function) should be performed periodically to monitor your progress or check for side effects. Consult your doctor for more details. 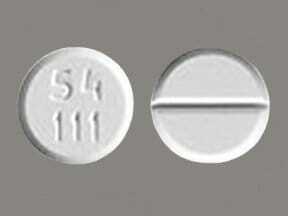 This medicine is a off-white, round, scored, tablet imprinted with "54 111". 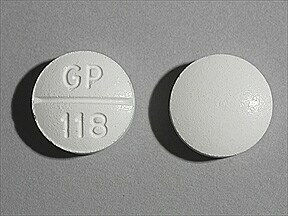 This medicine is a white, round, scored, tablet imprinted with "GP 118". 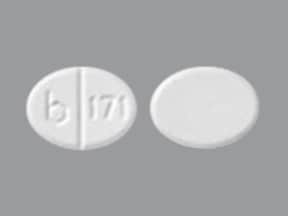 This medicine is a white, oval, scored, tablet imprinted with "b 171". Are you taking Mefloquine HCL? Are you considering switching to Mefloquine HCL? How long have you been taking Mefloquine HCL?